“Maud Powell was born on 22 August 1867, in Peru, Illinois, on America’s then western frontier. Her uncle John Wesley Powell was a Civil War hero and the first explorer of the Grand Canyon. He organized the scientific study of the western lands and of the native American Indians as the powerful director of the U.S. Geological Survey and Bureau of Ethnology and founder of the National Geographic Society. A prodigy, Maud Powell began violin study at seven in Aurora, then studied four years with William Lewis in Chicago. She completed her training with the great masters Henry Schradieck in Leipzig, Charles Dancla in Paris and Joseph Joachim in Berlin. She made her New York début in 1885 at eighteen performing the Bruch g minor Violin Concerto with America’s then foremost conductor Theodore Thomas and the New York Philharmonic. The intelligence, energy, and vigour in her playing reflected her American spirit and the brilliance, optimism and enthusiasm with which she lived. 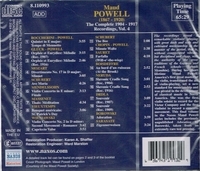 Powell performed with all the great European and American conductors and orchestras of her day, knew nearly every contemporary European and American composer personally and their music, and received international acclaim as one of the greatest artists of her time as she toured from St Petersburg in Russia, to South Africa, and to Hawaii.